Step out of your home and onto the beach. The view from the deck of the house. Relax on the sectional after a long day at the beach. Watch a show on the flat screen cable TV. This open kitchen has all the essentials for prepping your meals. The dishwasher provides easy clean up. 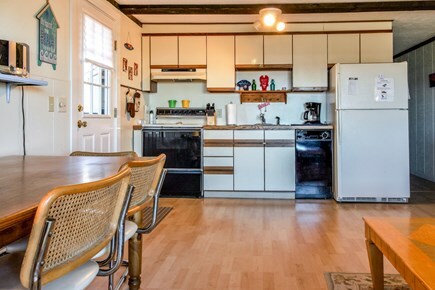 This ground floor condo is the perfect location. This queen bed will be perfect for after a long day in the sun. Relax by watching some TV before bed. The second bedroom also provides a queen size bed. Walk along the beach during the day, just outside your home. 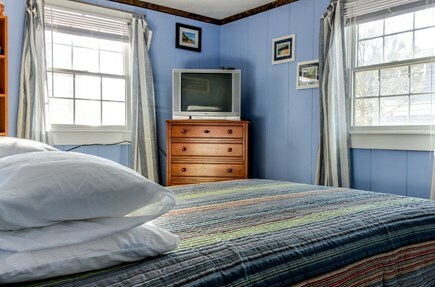 Stay at this Provincetown home just steps from the beach for an unforgettable Cape Cod getaway. 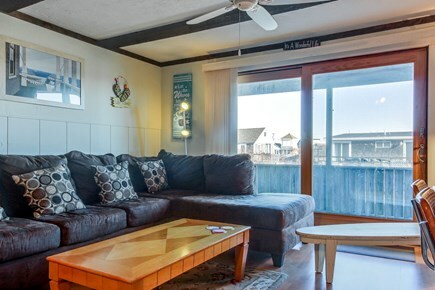 With a top-notch beachside location, updated amenities, and a deck with a gas grill, it's the perfect place for an amazing retreat. 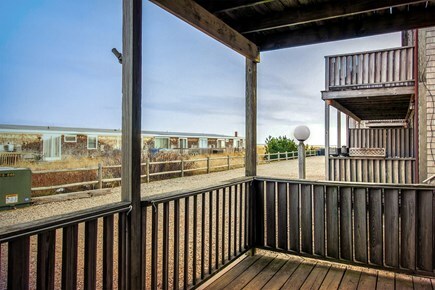 Located right around the corner from the beach, this condo is less than two miles from downtown Provincetown. 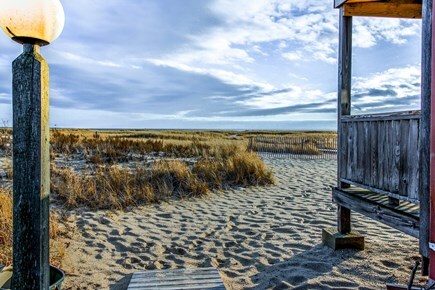 From relaxing on the beach to sailing the open ocean, this quintessential New England beach town has plenty to offer. Please note that there is parking provided for only one vehicle at this home. 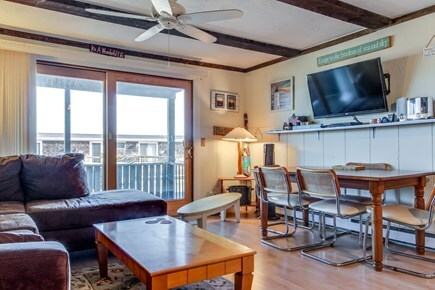 Inside this ground-floor condo, you'll have a cozy and inviting living space with a large sectional for relaxing after a long day on the beach. 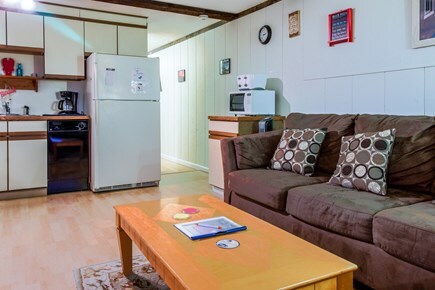 Watch a show on the flatscreen cable TV, or plan your next ocean activity on the complimentary WiFi. Large sliding glass doors lead out a lovely deck space, which overlooks the sandy path that leads to the beach. There's also a gas grill for making your BBQ favorites all summer long! 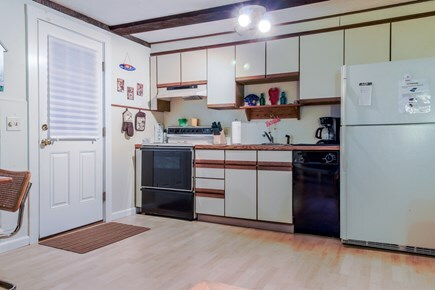 The efficient kitchen is open to the living space, and features all the essentials for prepping your own meals. There's even a dishwasher for easy cleanup! 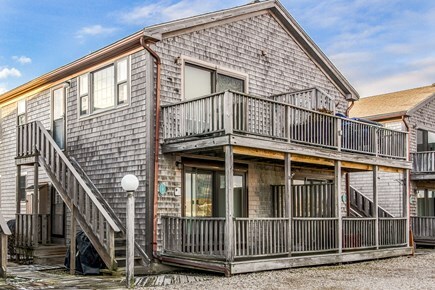 This home has a furnace to keep you warm on any chilly Cape Cod nights, plus there are beach chairs and fun games for your convenience. 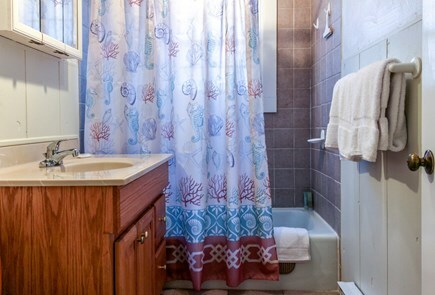 With two bedrooms and one bathroom, this home will comfortably sleep up to five guests. 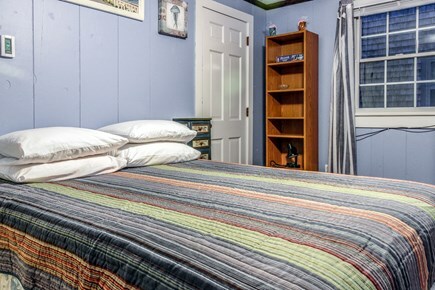 Each bedroom has a comfortable queen-size bed, as well as a dresser for your vacation wardrobe. There's also a sofabed in the living room. 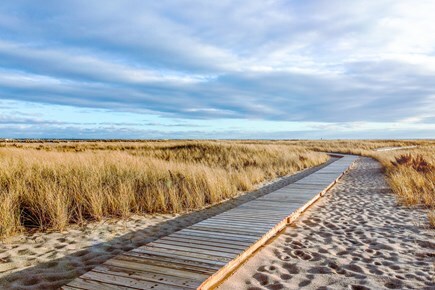 Head into the center of Provincetown just a short drive or bike ride away, where there's an array of fun activities and local culture to explore. From amazing theater shows and great restaurants to shopping boutiques and summer events, this classic Cape Cod destination will never disappoint. Get back to basics with a relaxing day on the beach - located just around the corner from the property. Simply follow the sandy path and the wooden dock, pick out your favorite spot, and lounge away the day in the summer sun. There's sailing, boating, and water sports nearby at the Provincetown marina. You can also catch a ferry at the marina to check out other cool beach towns on the Cape. There's lots of historic architecture and colonial history to explore in the surrounding area and in Provincetown - the town's history dates back to 1620! 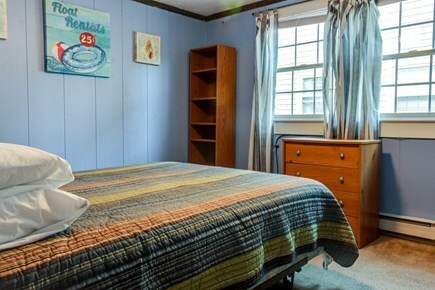 Plan a revitalizing trip to Cape Cod and stay at this quaint and inviting beach condo - book your trip! *Please note that no pets of any kind are allowed due to owner allergies. Thank you for being considerate. We were only able to stay for 2 days, but the unit was wonderful. It had everything we needed, including beach chairs and umbrella, and was quite clean. Thanks! 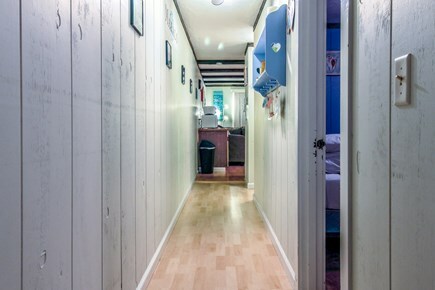 Great location, nice, clean and comfortable place. Beautiful views and cute area. Wish that there was a better way to cool the place, it became very warm and hard to sleep even with the windows open and ceiling fans on. Overall we had a great stay. We were there sat through Monday and enjoyed the surrounding area. Close to Provincetown- short drive. Nice place on the beach away from the hustle of downtown Provincetown.